Research shows that increasing access to information communication and technology (ICT) increases economic growth. In Mali, access to ICT products – especially the Internet – is extremely limited. According to the International Telecommunication Union (ITU), one percent of Malians have access to it; this is one of the lowest rates in Africa. For this reason, USAID/Mali asked the Business Growth Initiative (BGI) to identify concrete ways in which Internet access can be more sustainably provided in underserved areas by shared Internet access points. While a great number of government and donor initiatives have been implemented to expand Internet access, progress is slow. This may be explained, in part, by very limited collaboration in terms of public-private partnerships (PPP) or business-to-business relationships, which limits the impact their individual small budgets can make. Collaboration is needed in Mali to help eliminate supply and demand barriers limiting Internet access. Supply issues arise from a very uncompetitive telecommunications sector, limited and expensive electricity, and lack of ICT and business skills of ICT providers themselves. Demand-side constraints are based on an illiterate, poor market that does not understand the benefits of ICT because it lacks local content. These constraints are amplified in rural areas where limited access to the Internet is expensive and slow. There are a number of promising initiatives that will create more competition in the telecom sector. The Universal Service Fund (USF) will be utilized over the next few years to expand telecommunication services to rural areas. The Comité de régulation des télécommunications (CRT) – Mali’s telecommunications regulatory commission – needs to promote more transparency, competition and collaboration among telecom firms, specifically by developing regulation that promotes wholesale pricing for Internet Service Providers (ISP). If CRT accomplished this, it would catalyze more affordable Internet that will motivate rural ISP to increase access. 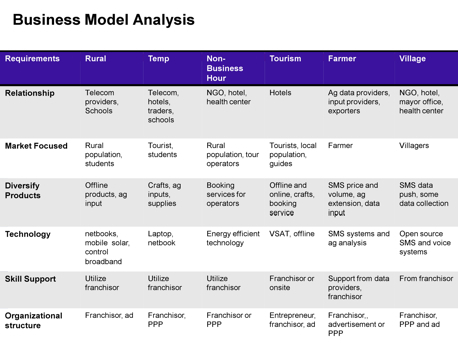 These models include a rural ICT center, a temporary ICT center, a non-business hour center, a tourism multimedia center, an agriculture marketing center and a village communication system. BGI considers these business models able to use different organizational structures: a traditional social enterprise, a PPP, a hub-and-spoke model, and an advertising model. An analysis of the business models, the best organizational structure for them and how they meet the principles is in Table 1. BGI’s analyses and business models were presented at a stakeholder meeting where stakeholders agreed to form an Internet working group under the Agency for Information Technology and Communications (AGETIC).